Pre-workoutPeak Intra-VeNOus - 1125g + 50 kaps. Package: 1125g + 50 kaps. 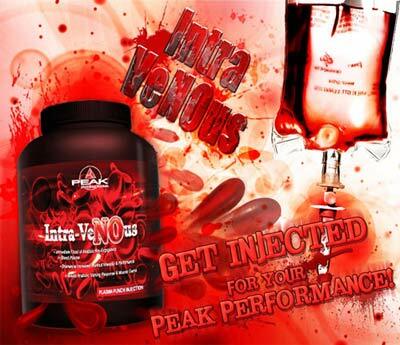 Intra Venous Peak 65 provides the ingredients anabolic and anti-catabolic in ultra-fast pace of your muscles, so that they can recover faster and be still in the process of anabolism. The best supplement that increases the feeling of pumps and adds energy during training, to conduct training over the limit of their abilities. Intra Venous Peak 65 provides the ingredients anabolic and anti-catabolic in ultra-fast pace of your muscles, so that they can recover faster and be still in the process of anabolism. The best supplement that increases the feeling of pumps and adds energy during training, to conduct training over the limit of their abilities. The product sports Intra Venous has an extraordinary speed, which can be compared to injection, what is its unique feature. Delivery of the components at a rapid rate during training is very important! This will ensure that you and your muscles maximum aerobic capacity and anaerobic. This results in effective inhibition of catabolic processes and initiate the overproduction of proteins in muscle regeneration after training phase which will result in anabolism in your body. During the test of strength with the participation of Russian bodybuilder Alexey Lesukova we observed effective inhibition of catabolic stress, a very fast recovery between sets, and increase the overall performance and strength of the player after the application of an innovative blend of Intra-Venous. Complex "matrix" of 65 ingredients with documented effectiveness in clinical trials needed during training, product Peak designed for the most demanding athletes who want to break all the possible limits of their own genetics and train at the highest level of intensity. Maximum boost muscle power through super fast glucose polymers, ALA, inositol and glucuronolactone. Each sip of the supplement will provide you with a powerful dose of energizing substances, which will allow the practice of intensive training under load conditions the body through katorżniczy regime of diet and exercise. In addition, preparation inhibits largely secretion of cortisol - a hormone catabolic, detrimental to the proper regeneration and growth of your muscles. The strongest market "booster" of nitric oxide in the body. It is responsible for the intense blood flow to working muscles during and after the completion of training. Guaranteed effect of the muscle pump. All you owe it combined two powerful forms of arginine, citrulline malate, norvaline and ornithine hydrochloride. It includes various forms of creatine, creatine alpha ketoglutarate, creatine taurate, magna creatine, Kre-Alkalyn, creatine malate, micronized creatine. In addition to creatine blend contains ingredients that take care of almost 100% absorption of creatine: beta-alanine, taurine, alpha ketoglutarate and taurine, D-ribose, resulting in an extreme increase in muscle strength and endurance. It protects your muscles and joints. Each component contained in the mixture accelerates the adaptation to a greater physical effort by the addition of effective antioxidant (N-Acetyl-L-Cysteine, green tea extract and grape seeds) adaptogens (Beta-ecdysterone, N-Acetyl-L-carnitine, extract Rosary mountain, Cordyceps and ginseng) and substances chondroprotekcyjnych (glucosamine sulfate, chondroitin sulfate, MSM). It provides the essential amino acids L-glutamine and BCAA, which inhibit the catabolism of exercise, stimulate protein synthesis and repair of muscle fibers and increase strength and endurance during training. It contains a complex of bioactive components: steroidal saponins from extracts of Tribulus terrestris, fengurek, flour and with the addition of bio-elements - zinc, magnesium, increases testosterone levels in the body. electro-In-Jection Complete level electrolytes lost in sweat during hard training. This ensures optimum neuromuscular exercise and stimulates the metabolism of the body. Inne składniki: regulatory kwasowości: kwas jabłkowy i kwas cytrynowy, średniołańcuchowe tri-glicerydy, inulina, fosforan wapnia, białka kolagenowe, naturalne i sztuczne aromaty, emulgator: lecytyna sojowa, substancja słodząca: sukraloza, sole magnezowe kwasów tłuszczowych, barwniki: koszenila i dwutlenek tytanu.